Andrea Barton is single but wants a child. When an infant is abandoned at a church on the north side of Chicago, Andrea first becomes a foster mother and then adopts her. Andrea believes that love and her experience as a social worker will see her through the challenges of raising an African-American child in a white world. During Pearl's childhood, Andrea is able to protect her daughter from many of society's blows. But when teenaged Pearl starts to seek her own identity, their relationship is threatened. Both mother and daughter face situations that force them to confront the possibilities and limits of love. Jan English Leary grew up in the Midwest and Central New York State. During her junior year at Smith College, she studied in Paris, an experience which fostered the love of travel that runs through her fiction. She received an M.A. in French Literature at Brown. While teaching French and raising her children, she completed an MFA in Creative Writing at Vermont College of Fine Arts. For the remainder of her career she taught fiction writing at Francis W. Parker School in Chicago and at Northwestern University. Her short fiction has appeared inPleiades, The Literary Review, The Minnesota Review, Carve Magazine, andLong Story, Short Literary Journal and other publications. She has received three Illinois Arts Council Awards. She lives in Chicago with her husband, John, an artist and former teacher. 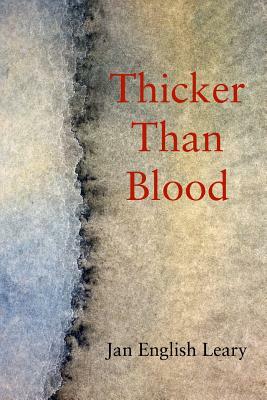 Thicker Than Bloodis her first novel."